Dr. Andrew Nash was born in Doneraile, County Cork, Ireland, in 1834. 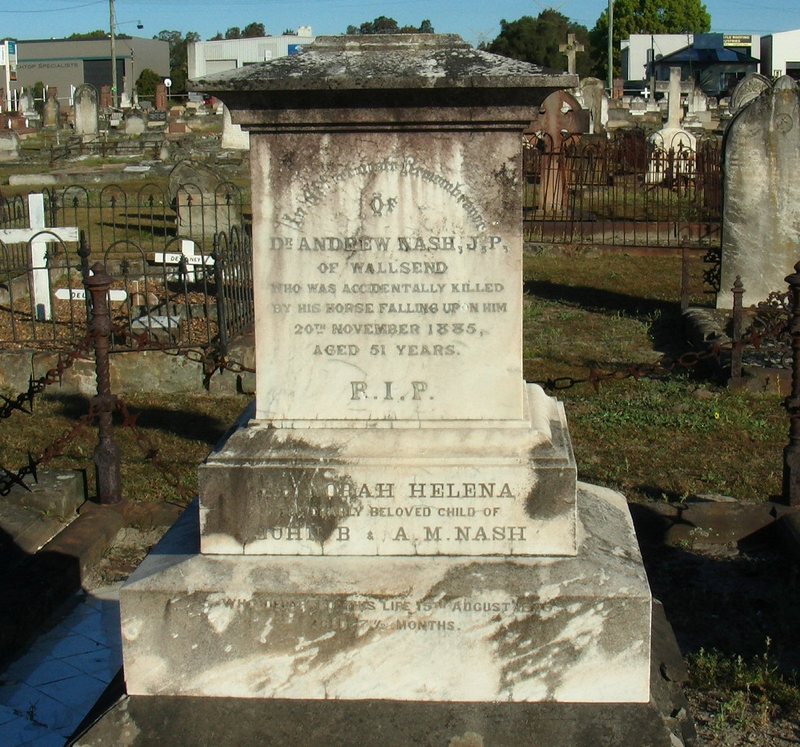 He gained his medical qualifications in Dublin, Glasgow, and London before immigrating to Australia in 1857 where he practised medicine in Kilmore, Victoria. In 1875 advertisements were placed in the Sydney Morning Herald by the Wallsend Medical Committee seeking a suitably qualified doctor to work at the Wallsend Colliery to replace the doctor who was leaving due to ill-health. The advertisement guaranteed 600 patients made up of miners, workmen and their families from the Wallsend Colliery. Dr Andrew Nash took up the position at the Co-operative Colliery in November 1875 and the Wallsend Colliery position shortly after. He was the medical officer for the Minmi collieries for several years and a member of the Honorary Medical Staff of the Newcastle Hospital. He was also a local director of the Great Northern Coal Company, Chairman of Directors of the W. and P. Gas Company, President of the Wallsend Jockey Club, and had an interest in the Wallsend School of Arts and the Mechanics' Institute at Plattsburg. Dr. Nash died while jumping one of his favourite racehorses, Satellite, over training hurdles, he was crushed when the horse caught its leg and fell. The orbituary in the Singleton Argus on the 25th November 1885 called him "a citizen with a large warm heart"... "a doctor, whom everyone loved for his skill, kindness, and unremitting attention when sickness or care racked the brain and shattered the constitution." His body was interred at Sandgate Cemetery and his funeral was attended by over 4000 mourners with more than 400 horsemen present. Br. Hugh Young of the Manchester Unity Independent Order of Odd Fellows (I.O.O.F.M.U.) presided over the ceremony as a clergyman was unable to attend. 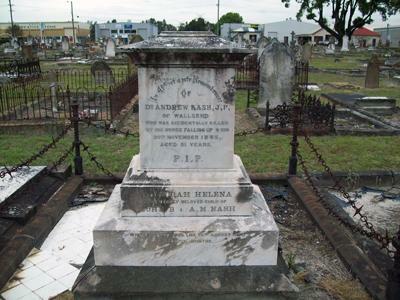 Dr Andrew Nash had two sons who also became doctors and worked in the Wallsend area. One was Dr. John Brady Nash who had a medical practice at Lambton and was instrumental in establishing Wallsend Hospital, and the other was Andrew W. Nash who was studying medicine at Edinburgh University at the time of his father's death, and later became one of the Medical Officers at Wallsend Hospital. "Professions, Trades Etc., Notice." The Sydney Morning Herald (NSW: 1842 - 1954), Thursday 7 October 1875:10. Web. 25 Mar. 2013. http://nla.gov.au/nla.news-article13365310. Punton-Butler, Suzanne. Nash's Folly, a History of Wallsend District Hospital 1885-1991. Broadmeadow: Newey & Beath, 2002. Print.